Tomato chutney is my all time favorite and it goes very well with traditional breakfast items. You may also use it make sandwiches! Method: Grind half the tomato pieces, red chilli powder, jeera powder and dhania powder into a paste. Heat oil in a kadai and add mustard seeds and jeera. When they start to sputter, add onions and fry till they become transparent. Add the remaining tomato pieces, turmeric powder and jaggery. Cover and cook till tomatoes are half cooked. Now add ground paste and required salt, and cook on low flame till oil separates. Garnish with curry leaves and coriander leaves. 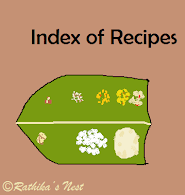 Serve hot with idly, dosa, adai, appam, kuzhi paniyaram or uppuma.